The handle has anatomical shape and is made of material "soft grip" a sure grip. It is separated from the blade guards * a * Integrated done in technopolymer. The handle includes a test on the same material as the blade. The blade is made in a special hardened stainless steel with a smooth side and a cutting edge. This side of the blade end, near the handle with a cavity to cut fishing nets and wires. The case is made in black technopolymer and has rubber tapes for fixing in the thigh or belt. The system of stick the knife in the sheath is via a button built into the quay structure of it and drive fast. 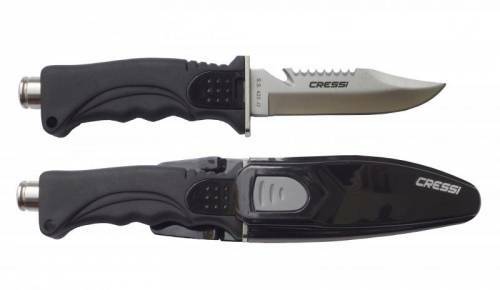 The knife comes standard with two rubber strips for fixing it to the thigh.